Cost Breakdown: Including the 1-time $375 donation and the monthly maintenance fee of $34, you will be charged a total of $409 today. You will only be charged $34/month until the equipment is returned to Project NOLA. Charitable donations are tax deductible. 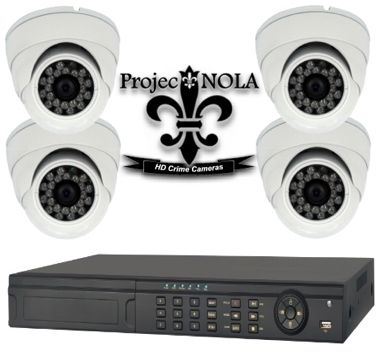 By accepting this loaner crime camera package, borrower agrees to participate with the Project NOLA nonprofit crime camera system by facing at least one crime camera towards a public thoroughfare or street, ensuring that the included DVR remains connected to broadband Internet, and paying the monthly maintenance fee, which helps cover Project NOLA's operating cost. Borrower also assumes responsibility for the care and upkeep of the loaned equipment and of any damage that may be incurred due to an act of God, vandalism, or negligence. In the event of a malfunction due to factory defect, borrower is highly encouraged to immediately call Project NOLA at (504) 736-9187 to request a free replacement or tech support. NOTE: Unlike our wifi loaner crime camera kits and packages that may easily be self-installed, the cameras in this package must be hard-wired to the DVR recorder and must be professorially installed. Should you not already know a professional installer, please note that Project NOLA maintains a list of licensed installers that give back to the community by installing Project NOLA equipment at discounted prices. Call us at (504) 736-9187 should you wish us to make an introduction. Thanks in advance for sponsoring this crime camera package. Once you you eventually return it back to Project NOLA, we will provide it free of charge to a resident, church or nonprofit organization in a crime-challenged neighborhood within New Orleans that may not otherwise be able to afford a good camera system. NOTE: In addition to recording the FOUR cameras that are included with this package, the DVR may also record an existing IP crime camera that you may already have. Four BNC inputs support HD-TVI, AHD, CVI, and 960H formats. A single IP camera may be added as a 5th (bonus) camera.